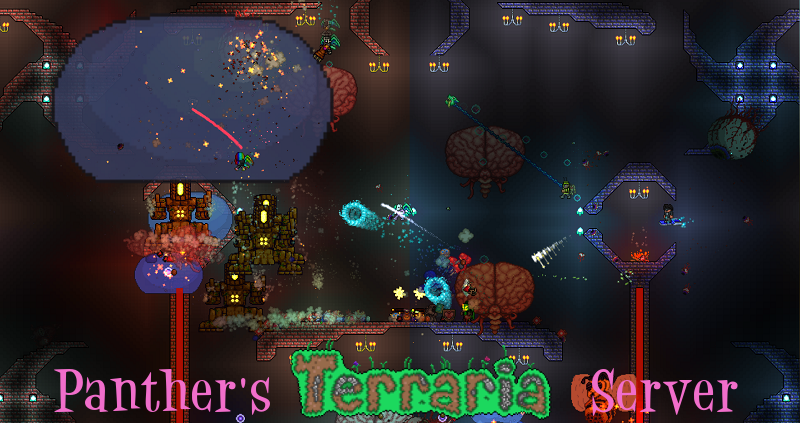 Panther's Terraria server is a highly cusomised, free-for-all server invites players of all kinds to come and play! Our server supports many build in minigames, such as Spleef, Conquer, Deathmatch, Last Man Standing and more! We use Server Side Characters (SSC) on Panther's Terraria Server, along with that we have "SEconomy" that provides players with a cheat proof, server side currency. This currency has many uses such as special casting spells & commands, leveling up and buying items for your character from the world shop. All new players are free to build anywhere they like (as long as someone else hasn't claimed the land first) and protect their building with our House Regions plugin. Throughout the day there the server is host to a number of customized boss battles and invasions so there is always something exciting going on. Each day the map resets and every few hours all unprotected/damaged areas regenerate so the server world is always fresh to explore! We have many Moderators on the server that work to keep the greifers/trolls out as well as help out all the new players. Further to that, we have a chat filter to filter out any bad words so the server can be rated E for Everyone.